A determined cop battles a crime syndicate. Fritz Lang’s gripping crime thriller gets a release as sharp and steely as the film itself. When a cop puts a bullet to his head, leaving a suicide note, it seems an open and shut case. Why then does his newly widowed wife Bertha (Jeanette Nolan) hide said note and instead contact criminal don Mike Lagana (Alexander Scourby), a crime lord with a nifty line in PJs and male companions always on hand with a willing cigarette. Enter Dave Bannion (Glenn Ford) a straight shooter assigned to the case who upsets the apple cart when he digs a little deeper due to the concerns of the dead cop’s mistress. So far so Hollywood, but then things get a little strange and murderous. Lang belongs to a clique of World War II emigres who thrived in their own country but also embraced the Hollywood system with aplomb, and while Lang never used the camera in the same way that he did in his early peerless German silent movies, he still managed to pack his later films with a distrust of systems of power that seems positively socialist in an era of American exceptionalism. There is also an aura of extreme brutality around The Big Heat. You might not see the full effect of the violence but there is something in the way that Lucy (Dorothy Green), the cop’s mistress, is described once found dead as having being tortured and covered with cigarette burns that chills the bones. It also helps sell it that Lee Marvin, as Lagana’s psycho henchman and amateur barista Vince Stone, plays a sociopath so convincingly. The film's masterstroke is Ford as a family man turned avenging angel. Almost the embodiment of '50s nuclear family values, the establishment of his family life and marriage are drawn with such swift economy that when the rug is pulled from under him and the brutality and danger of what he is up against is revealed, there is a genuine feeling of shock. Ford's volte face from Elliot Ness to Dirty Harry is convincing and brutal. Is it possible to maintain a moralistic centre when fighting against avarice and corruption, or once you get down in the dirt you’ll never be clean again are just some of the questions the film posits. It may have the clean edges and the mundane by the numbers score of many a Hollywood picture, but it asks difficult, uncomfortable questions. Surprisingly modern is its depiction of Lagana as a crime boss who mixes with the upper echelons of society, using his criminal standing to invest into the legitimate world. Marvin also adds a note of queasy ambiguity; is Vince just a violent sociopath taking his violence out on his moll Debby (Gloria Grahame) because he can? Or is he taking unhealthy steps to suffocate his more than professional admiration of his boss? A film then steeped in violence, troublingly mainly aimed at women but also refreshing in that the female characters have more to do than sit on the side cheering their partners on. The instigator of the violence is Bertha, who holds the information to blackmail Lagana, Lucy instigates the investigation and an act of sheer brutality against Debby brings everything crumbling down. In Lang’s film men may be doing all the heavy lifting, but it’s the women that hold all the cards, as dangerous as that may be. A film that reveals more with every viewing, and one that is rightly a classic of crime cinema and of Lang’s Hollywood period. A quite wonderful selection of extras including discussions with Martin Scorsese and Michael Mann, and a 30-minute appreciation of the film from esteemed critic Tony Rayns, which repeats some well-worn anecdotes regarding Lang’s dealing with the Nazi regime and an appreciation of the film. Add to that a film commentary from film historian Lem Dobbs, Julie Kirgo and Nick Redman, a pin sharp remaster with original mono audio, not to mention a 36-page booklet with a new essay by critic Glenn Kenny, an interview with Fritz Lang and a look at the film's production code dealings. A selection of extras befitting a film of this stature that maintains the standard for what is fast becoming a golden age for boutique labels in the UK. 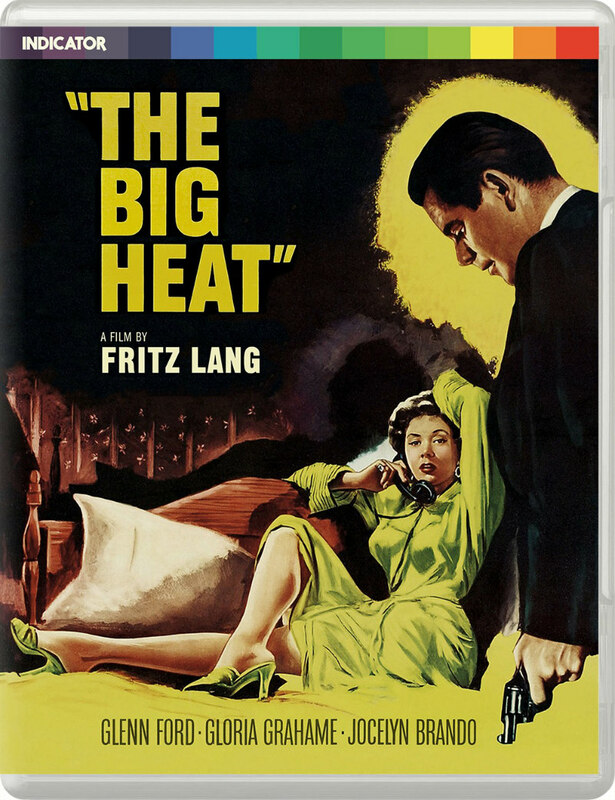 The Big Heat is available on blu-ray now from Powerhouse Indicator.